Israel had impressive achievements at the European Championship in wheelchair dancing held in Poland this week. 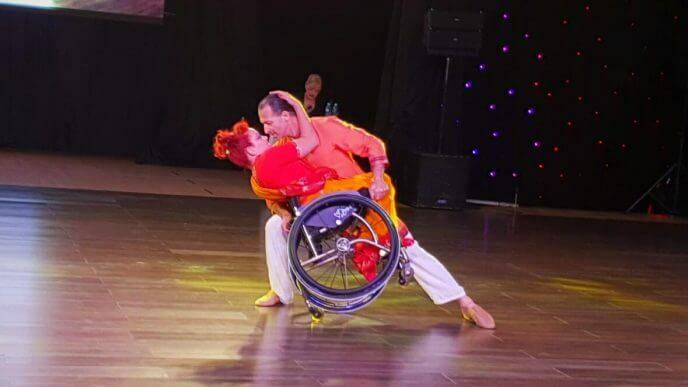 Tel Aviv Beit Halochem wheelchair dancer Vital Zinger and her standing dancing partner Shon Ziv, won a Silver Medal with a Bollywood dance, which swept the entire audience and accorded the two a long standing ovation. Later in the competition, Zinger and Ziv also won a Bronze Medal in the Latin Dance category. Margalit Tomer, also in a wheelchair, won two Silver Medals in women’s freestyle solo category, and wheelchair dancers Sami Dahan and Meital Wax, won three Bronze Medals in three dance styles, standard, Latin and freestyle. All the dancers rehearse at Beit Halochem Tel Aviv under the guidance and choreography of Coach Yelena Feitlicher.